Finding the right food for your dog is essential to their wellbeing. Not only must it contain everything they need for their age and stage of development, but it must also taste nice if they are going to eat and enjoy it. 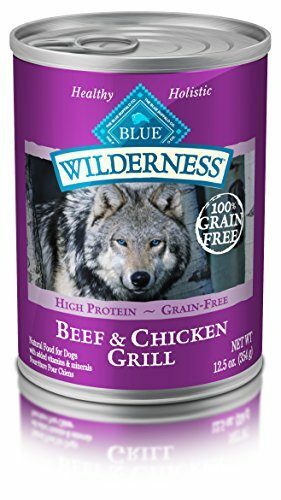 Blue Buffalo dog food is one of the best brands on the market, producing food that meets both of these two important requirements. Check out our recommendations for the 10 best Blue Buffalo Dog Foods below. One of the many benefits of BLUE Life Protection Formula is that it is made from real meat. The formula uses protein-rich deboned chicken as its main ingredient. It also contains whole grain brown rice, fruits and vegetables. The ‘LifeSource Bits’ included in the kibble contain a specific blend of vitamins, minerals and antioxidants. These ‘Bits’ are processed at a lower temperature to the rest of the kibble to help prevent any degradation and to preserve the potency of the ingredients. 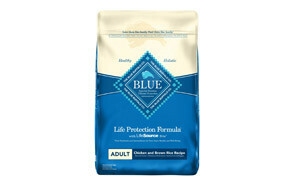 BLUE Life Protection Formula does not contain any poultry by-product meal, corn, soy or wheat. This makes it ideal for owners who are concerned about the use of these elements in their pet’s food. The food also does not contain any artificial preservatives, color or flavors. 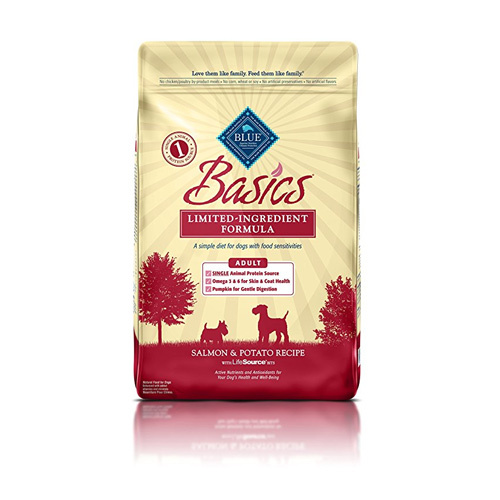 BLUE Basics Limited Ingredient Formula is ideal for dogs with sensitive digestive systems or sensitivities to specific foods. It is made from single source protein and contains no corn, wheat, diary, eggs or soy. Its main ingredient is Turkey, followed by easily digestible carbohydrates such as peas, potatoes and pumpkin. The formula manages to balance suitability for sensitive stomachs with providing the vitamins and minerals that adult dogs need. The food contains Omega 3 and 6, as well as vitamin B6, B12, D3 and Folic Acid. And as with all BLUE products it is also free from artificial colors, flavors and preservatives. 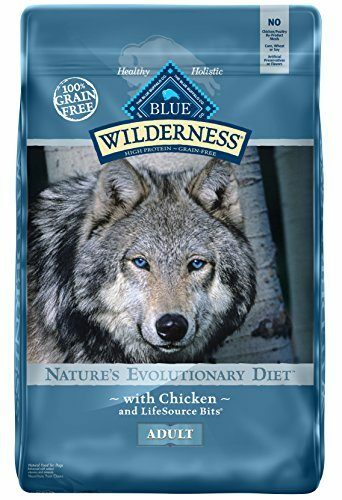 If you are looking for a grain free alternative food that still provides everything your dog needs, then BLUE Wilderness High Protein Grain Free food is for you. Made with de-boned chicken, chicken meal, and fish meal the food is high in protein. It provides balanced nutrition, with vitamins and minerals from fruits and vegetables. The ‘LifeSource Bits’ provide your dog with their necessary intake pf calcium, Phosphorus and vitamins including B Vitamins, 1,2, 3, 5, 6, 7, and 12, D3 and Folic Acid. The formula is free from artificial colors, flavors and preservatives, giving owners peace of mind and as well providing a tasty meal for your pet pooch. If gluten is a problem for your cuddly canine, then this is the food for them. It provides all the balanced nutrition your dog needs but contains no gluten-based grains. The main ingredient is de-boned chicken closely followed by a range of fruits and vegetables, which provide the vitamins and minerals your dog needs to stay healthy. As well as being gluten free, the formula is free from artificial colors, preservatives and flavors, and contains no soy or poultry by-products. As with all BLUE dry food products, this food contains ‘LifeSource Bits’. This provides your dog with the full range of B vitamins, as well as Vitamins C and D that they need to stay well and maintain a healthy coat and skin. 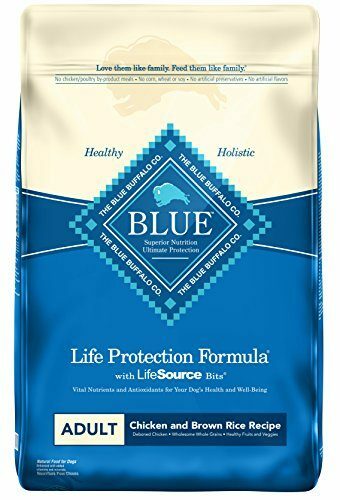 If you are looking for an alternative to dry food, then consider a high-quality wet food alternative, such as the BLUE Homestyle Recipe. This wet food uses quality ingredients to provide the vitamins, minerals and essential amino acids that your dog needs. 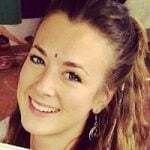 The main ingredient in the food is meat, followed by fruits, vegetables and whole grains. It provides your furry friend with a complete balance of vitamins A, B, D and E, as well as Folic Acid and essential amino acids. It contains no poultry by-produces, wheat, soy or corn, and no artificial colors, flavors, or preservatives. If you have a small breed, then one of the problems with wet food is that there is often left-over food in the can that needs to be stored. 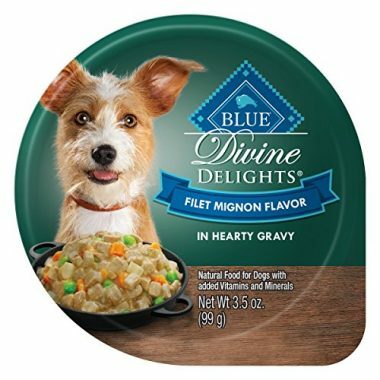 BLUE Divine Delights solves this problem by providing single serving sized portions that are perfect for small dogs. The food is not only the right size for your pet pooch, but also contains the right balance of vitamins, minerals, and amino acids that small dogs need. Made from high-quality meat, vegetables and fruits, each serving provides the right balance of Vitamin A, the full range of B Vitamins your dog needs, and Vitamin D3. Created without using poultry by-products, corn, wheat, or soy, you can be assured that BLUE Divine Delights will delight your small breed dog. It is also free from artificial preservatives, colors and flavors. Grains can cause difficulties for some dogs, and the inclusion of them in food often worries owners. If this is the case for you, then BLUE Wilderness High Protein Grain Free wet dog food for adults could be the answer. Made primarily with beef and chicken it provides the perfect balance of vitamins, minerals and amino acids your dog needs. The high-quality protein provides an ideal alternative to raw food diets, which can be time-consuming and difficult to prepare. 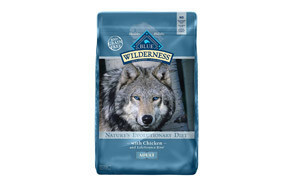 As with all BLUE dog food products, this food contains no wheat, corn, soy or poultry by-products. It is also free from artificial preservatives, colors and flavors, making it a healthy alternative to dry foods as well as raw food diets. If your dog prefers wet food, you may be concerned that their teeth, gums and jaws are not getting the exercise and care they need. 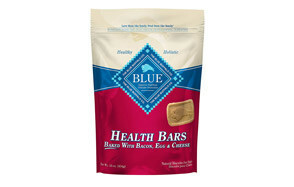 Adding BLUE Health Bars to your dog’s daily diet is the perfect answer. Made with vegetables and whole grains, and fortified with antioxidants and omega fatty acids, they provide a great crunchy treat that won’t harm your dog’s health. 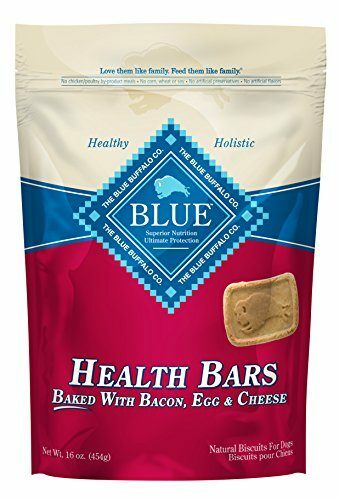 As with all BLUE products these treats contain no poultry by-products, corn, wheat, or soy. They are also free from artificial preservatives, colors and flavors. It is important to remember that while these are healthy treats they are not intended to replace your dog’s normal meals. We all know the benefits of positive dog training, but it can be difficult to find a treat to use as a reward that is also good for your dog. BLUE Bits Training Dog Treats are the answer to this problem. The treats are specially designed with the needs of young dogs and puppies in mind. They contain DHA to help support cognitive development and Omega 3 and 6 Fatty Acids to promote a healthy skin and coat. While designed for young dogs, they contain nothing that is detrimental to older dogs that require a little extra incentive to train. Created from beef and whole grains, these treats also provide an additional source of Vitamin E. While tasty and supportive of training, it is important to remember that these are not a substitute for dog food and do not contain the full range of vitamins and minerals that your dog needs from its regular meals. The treats are free from artificial colors, flavors, and preservative. They also do not contain poultry by-produces, wheat, corn or soy, so are unlikely to upset young tummies. 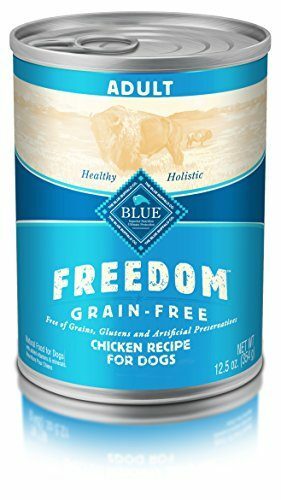 BLUE Freedom is created without any gluten containing grains, so it is perfect for pet pooches who have intolerances, or for owners who are concerned about feeding grains to their four-legged friends. Along with being grain free, this recipe is free from poultry by-produces, dairy, eggs, corn and soy. It is also free from artificial colors, preservatives and flavors, giving you peace of mind that there is nothing in it that will harm your dog’s health. When considering the right dog food for your beloved pet, it can help to know a little more about the company behind the product. 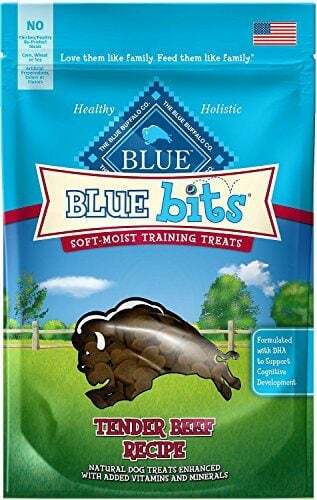 Here, we will provide you with information about Blue Buffalo dog food and the reasons why you should consider their products for your pets. 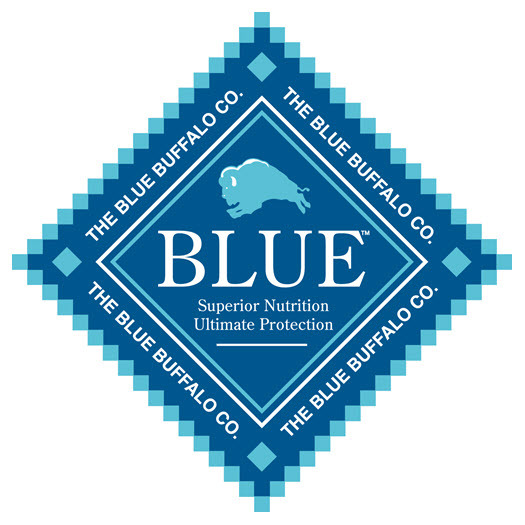 Blue Buffalo is a family run company. The Bishop family started the company after the family’s beloved pet Blue started to have health issues. Way back when, Bill Bishop and his two sons set out to create a pet food that used only the highest quality natural ingredients. The company has now been in business for ten years and continues to create high-quality natural pet food. As well as creating pet foods that your pet will love, Blue Buffalo is also involved in the community, helping pets in need, and work towards ending pet cancers. 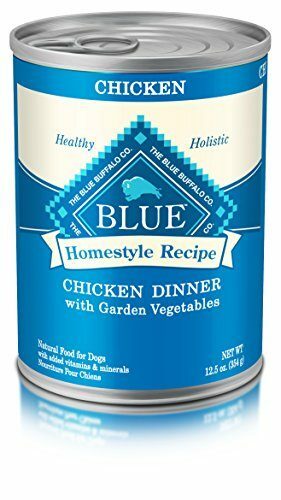 Why Should You Choose Blue Buffalo Dog Food? The main reason to choose Blue Buffalo for your pet is the quality of the ingredients that are used in their wet and dry food, and in their pet snacks. Plus, all the food they produce has meat as its top ingredient and no poultry by-products or fillers are used. 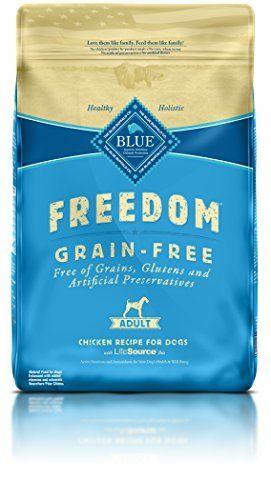 Fortunately, Blue Buffalo takes pet health and owner concerns seriously and all the food it produces is wheat, corn and soy free. Additionally, several products in their range are completely grain free, for dogs with extra sensitive digestive systems. Finally, you never find artificial colors, flavors or preservatives in Blue Buffalo dog food. The wide range of choice that is available is another reason why you should consider this brand. They produce both wet and dry food in a variety of flavors, as well as food that is specifically designed for sensitive digestive systems, young dogs and seniors.